1812 – Kaspar Hauser born. German youth who claimed to have grown up in the total isolation of a darkened cell. Hauser’s claims, and his subsequent death by stabbing, sparked much debate and controversy. 1896 – Reverend Gary Davis born. American blues and gospel singer and guitarist, who was also proficient on the banjo and harmonica. His finger-picking guitar style influenced many other artists including Bob Dylan, The Grateful Dead, Jackson Browne, Townes van Zandt, Wizz Jones, Jorma Kaukonen and Godspeed You Black Emperor!. 1945 – Adolf Hitler and Eva Braun committed suicide after being married for one day. 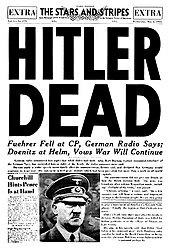 Hitler shot himself and Braun took cyanide. In accordance with Hitler’s instructions, the bodies were burned in the garden behind the Reich Chancellery. 1963 – The Bristol Bus Boycott was held in Bristol to protest the Bristol Omnibus Company‘s refusal to employ Black or Asian bus crews. In common with other British cities there was widespread discrimination in housing and employment at that time against “coloureds.” Led by youth worker Paul Stephenson and the West Indian Development Council, the boycott of the company’s buses by Bristolians lasted for four months until the company backed down and overturned the colour bar. The boycott drew national attention to racial discrimination in Britain and the campaign was supported by national politicians, with interventions being made by church groups and the High Commissioner for Trinidad and Tobago. The Bristol Bus Boycott was considered by some to have been influential in the passing of the Race Relations Act 1965 which made “racial discrimination unlawful in public places” and the Race Relations Act 1968, which extended the provisions to employment and housing. 1910 – The Parliament of the United Kingdom passed the People’s Budget, the first budget in British history with the expressed intent of redistributing wealth among the British public, introducing many unprecedented taxes on the wealthy and radical social welfare programmes to Britain’s political life. Since the 1970s, British governments have reversed the policy, attempting to redistribute wealth into the hands of the already wealthy. 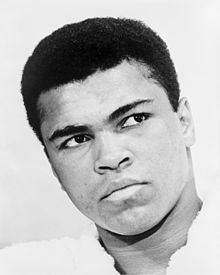 1967 – After refusing induction into the United States Army the day before (citing religious reasons), Muhammad Ali was stripped of his boxing title and his boxing license was suspended. He was not imprisoned for draft evasion, but did not fight again for nearly four years while his appeal worked its way up to the U.S. Supreme Court, where it was eventually successful. 2008 – Albert Hofmann died. Swiss scientist, best known for being the first person to synthesize, ingest, and learn of the psychedelic effects of lysergic acid diethylamide (LSD). Hofmann also was the first to isolate, synthesize, and name the principal psychedelic mushroom compounds, psilocybin and psilocin. 1789 – The Mutiny on the Bounty, aboard the British Royal Navy ship HMS Bounty. The mutiny was led by Fletcher Christian against commanding officer Lieutenant William Bligh. According to most accounts, the sailors were attracted to the idyllic life on the Pacific island of Tahiti and were further motivated by harsh treatment from their captain. Mutineers set Bligh afloat in a small boat with some crew loyal to him. The mutineers then variously settled on Pitcairn Island or in Tahiti and burned the Bounty off Pitcairn Island, to avoid detection and to prevent desertion. Bligh navigated the 23-foot (7 m) open launch on a 47-day voyage to Timor in the Dutch East Indies, equipped with a quadrant and pocket watch and without charts or compass. He recorded the distance as 3,618 nautical miles (6,710 km). He then returned to Britain and reported the mutiny to the Admiralty on 15 March 1790, 2 years and 11 weeks after his original departure. Descendants of some of the mutineers still live on Pitcairn Island. 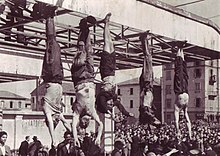 1945 – Benito Mussolini and his mistress Clara Petacci were executed by a firing squad consisting of members of the Italian resistance movement. He had been traveling with retreating German forces and was apprehended while attempting to escape recognition by wearing a German military uniform. His body was then taken to Milan where it was hung upside down at a petrol station for public viewing and to provide confirmation of his demise. 1948 – Terry Pratchett born. English author of fantasy novels, best known for the Discworld series of about 40 volumes – since his first Discworld novel (The Colour of Magic) was published in 1983, he has written two books a year on average. His latest Discworld book, Snuff, was at the time of its release the third-fastest-selling hardback adult-audience novel since records began in the United Kingdom, selling 55,000 copies in the first three days. Pratchett was the UK’s best-selling author of the 1990s, and has sold over 70 million books worldwide in 37 languages. He is currently the second most-read writer in the UK, and seventh most-read non-US author in the US. 1759 – Mary Wollstonecraft born. British writer, philosopher, and advocate of women’s rights. During her brief career, she wrote novels, treatises, a travel narrative, a history of the French Revolution, a conduct book, and a children’s book, though she is best known for A Vindication of the Rights of Woman (1792), in which she argues that women are not naturally inferior to men, but appear to be only because they lack education. She suggests that both men and women should be treated as rational beings and imagines a social order founded on reason. Wollstonecraft married the philosopher William Godwin, one of the forefathers of the anarchist movement, while her daughter Mary Wollstonecraft Godwin, later Mary Shelley, the author of Frankenstein, would become an accomplished writer herself. 1947 – Ann Peebles born. American singer-songwriter who gained celebrity for her Memphis soul albums of the 1970s on the Hi Records label. 1998 – Carlos Castaneda died. Peruvian author and student of anthropology. Starting with The Teachings of Don Juan in 1968, Castaneda wrote a series of books that describe his alleged training in shamanism. The books, narrated in the first person, relate his supposed experiences under the tutelage of a Yaqui “Man of Knowledge” named Don Juan Matus. His 11 books have sold more than 28 million copies in 17 languages. Critics have suggested that they are works of fiction; supporters claim the books are either true or at least valuable works of philosophy and descriptions of practices which enable an increased awareness. 1886 – Ma Rainey born. One of the earliest known American professional blues singers and one of the first generation of such singers to record. she has been billed as The Mother of the Blues. She was known for her very powerful vocal abilities, energetic disposition, majestic phrasing, and a ‘moaning’ style of singing similar to folk tradition, though her powerful voice and disposition are not captured on her recordings (due to her recording exclusively for Paramount, which was known for worse-than-normal recording techniques and among the industry’s poorest shellac quality), the other characteristics are present, and most evident on her early recordings, Bo-weevil Blues and Moonshine Blues. She also recorded with Louis Armstrong. 1937 – Spanish Civil War: Guernica (or Gernika in Basque), Spain bombed by German Luftwaffe, causing widespread destruction and civilian deaths – the Basque government reported 1,654 people killed. The bombing was the subject of a famous anti-war painting by Pablo Picasso. It was depicted by Heinz Kiwitz, a German artist who made a woodcut of it and later was killed fighting in the International Brigades. The bombing shocked and inspired many artists: Guernica is also the name of one of the most violent of René Iché sculptures, one of the first electroacoustic music by Patrick Ascione, of a musical composition by René-Louis Baron and a poem by Paul Eluard (Victory of Guernica). There is also a short film from 1950 by Alain Resnais entitled Guernica. 1938 – Duane Eddy born. American guitarist. In the late 1950s and early 1960s he had a string of hit records, produced by Lee Hazlewood, which were noted for their characteristically “twangy” sound, including “Rebel Rouser”, “Peter Gunn”, and “Because They’re Young“. He had sold 12 million records by 1963. 1940 – Giorgio Moroder born. Italian record producer, songwriter and performer. When in Munich in the 1970s, he started his own record label called Oasis Records, which several years later became a subdivision of Casablanca Records. He collaborated with Donna Summer during the disco era (including “Love to Love You Baby” and “I Feel Love“) and was the founder of the former Musicland Studios in Munich, which was used as a recording studio by artists including the Electric Light Orchestra, Led Zeppelin, Queen and Elton John. Moroder also produced a number of electronic disco hits for The Three Degrees, two albums for Sparks, songs for performers including David Bowie, Irene Cara, Madleen Kane, Melissa Manchester, Blondie, Japan, and France Joli. 1970 – Gypsy Rose Lee died. American burlesque entertainer famous for her striptease act. She was also an actress, author, and playwright whose 1957 memoir was made into the stage musical and film Gypsy. Trying to describe what Gypsy was (a “high-class” stripper), H. L. Mencken coined the term ecdysiast. Her style of intellectual recitation while stripping was spoofed in the number “Zip!” from Rodgers and Hart‘s Pal Joey, a play in which her sister June appeared. Gypsy can be seen performing an abbreviated version of her act (intellectual recitation and all) in the 1943 film Stage Door Canteen. Tagged as 1886, 1937, 1938, 1940, 1970, actress, Alain Resnais, American guitarist, author, Basque, basque spain, Because They're Young, blondie, blues singer, bo weevil, Bo-weevil Blues, burlesque entertainer, Casablanca Records., celebrities, David Bowie, Donna Summer, Duane Eddy, e stage musical a, ecdysiast, Electric Light Orchestra, electroacoustic music, Elton john, entertainment, film, France Joli., German, Giorgio Moroder, Guernica, Gypsy Rose Lee, Gypsy., H. L. Mencken, Heinz Kiwitz, http www youtube, I Feel Love, International Brigades., Irene Cara, Italian, Japan, Led Zeppelin, Lee Hazlewood, Louis Armstrong, Love to Love You Baby, Luftwaffe, Ma Rainey, Madleen Kane, Melissa Manchester, Moonshine Blues, Munich, music, Musicland Studios, Oasis Records, Pablo Picasso, Pal Joey, Paramount, Patrick Ascione, Paul eluard, performer, Peter Gunn, playwright, Queen, Rebel Rouser, record producer, René Iché, René-Louis Baron, Rodgers and Hart, Songwriter, Spain, Spanish Civil War, Sparks, Stage Door Canteen., striptease, The Mother of the Blues, The Three Degrees, twangy, Zip! 1599 – Oliver Cromwell born. English military and political leader and later Lord Protector of the Commonwealth of England, Scotland and Ireland. He entered the English Civil War on the side of the Parliamentarians. Nicknamed “Old Ironsides”, he was quickly promoted from leading a single cavalry troop to become one of the principal commanders of the New Model Army, playing an important role in the defeat of the royalist forces. Cromwell was one of the signatories of King Charles I’s death warrant in 1649, and as a member of the Rump Parliament (1649–53) he dominated the short-lived Commonwealth of England. Cromwell is one of the most controversial figures in the history of the British Isles, considered a regicidal dictator by historians such as David Hume, but a hero of liberty by others . 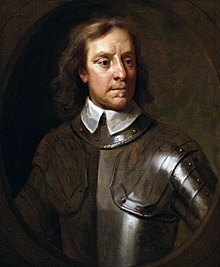 In a 2002 BBC poll in Britain, Cromwell was selected as one of the ten greatest Britons of all time. 2005 – Hasil Adkins died. American country, rock and roll, and blues musician, though he was frequently considered rockabilly and sometimes primitive jazz. He generally performed as a one-man band, playing guitar and drums at the same time. With his 45 recordings of “Chicken Walk” appearing on Air Records in 1962 and “She Said” on Jody Records in 1966, his original, frenetic sound meshed with demented lyrics ushered in the genre known as psychobilly. Recurring themes in his work include love, heartbreak, police, death, decapitation, hot dogs, aliens, and chicken. He often noted in interviews that his primary heroes and influences were Hank Williams Sr., Jimmie Rodgers, Little Richard, and Col. Harlan Sanders, the inventor of Kentucky Fried Chicken. Adkins had a strong influence on The Cramps, and his cult status is kept alive by the growing appreciation of, and demand for, outsider music and primitive rock and roll. 2008 – Humphrey Lyttelton died English jazz musician and broadcaster, and chairman of the BBC radio comedy programme I’m Sorry I Haven’t a Clue. As a performer, he is perhaps best-remembered for the hit single “Bad Penny Blues” , the first British jazz record to get into the Top Twenty, and which stayed there for six weeks. Its success was very much due to the very catchy piano riff, played by Johnny Parker and brought to the front by the producer, the legendary Joe Meek. 1932 – Benny Rothman led the mass trespass of Kinder Scout, leading to substantial legal reforms in the United Kingdom. It was undertaken at Kinder Scout, in the Peak District of Derbyshire, England, to highlight that walkers in England and Wales were denied access to areas of open country. The trespass proceeded via William Clough to the plateau of Kinder Scout, where there were violent scuffles with gamekeepers. The ramblers were able to reach their destination and meet with another group. On the return, five ramblers were arrested, with another detained earlier. Trespass was not, and still is not, a criminal offence in any part of Britain, but some would receive jail sentences of two to six months for offences relating to violence against the keepers. The mass trespass marked the beginning of a media campaign by The Ramblers Association, culminating in the Countryside and Rights of Way Act 2000, which legislates rights to walk on mapped access land. Poet and folk singer Ewan MacColl celebrated these events in his song “The Manchester Rambler”. 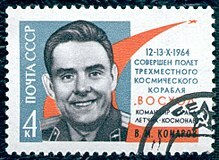 1967 – Cosmonaut Vladimir Komarov died in Soyuz 1 when its re-entry parachute failed to open. He was officially the first human to die during a space mission…although it’s probable that there were earlier deaths that were covered up. 2009 – John Michell died. English writer whose key sources of inspiration were Plato and Charles Fort. In some 40-odd titles over five decades he examined, often in pioneering style, such topics as sacred geometry, earth mysteries, geomancy, gematria, archaeoastronomy, metrology, euphonics, simulacra and sacred sites, as well as Fortean phenomena.